Is it 2004 already? Well, no, but Yamaha thinks it is ready to announce the 2004 FJR1300 and FJR1300ABS. Actually, we get plenty of press releases here at MD, and we are selective about those we print. This one caught our eye for two reasons. First of all, it is a new model announcement (well, at least, an updated model). Second, it illustrates a point we have made several times in the past. Namely, that Yamaha has become very quick on its feet . . . listening carefully to its customers, and responding quickly with product changes. In only its second model year in the United States, the FJR gets the ABS option, much larger brakes, a four-inch taller wind screen, and stiffer suspension, both front and rear. Among other minor tweaks, these items stand out, and represent a very quick response to comments made by customers and the press after riding last year’s model. The stiffer suspension, particularly in the back, should make the bike handle much better this year. Oh . . . yeah, and dig that new Cerulean Silver paint job! Okay, here is Yamaha’s unedited release. Until the Yamaha FJR1300 was introduced last year, the sport-touring category in the U.S. seemed to be lacking something. The comfort was there, the multi-role capability, passenger/luggage capacity, too – but a critical ingredient was missing. The FJR1300 added the perfect pinch of just what that missing ingredient was: high performance. 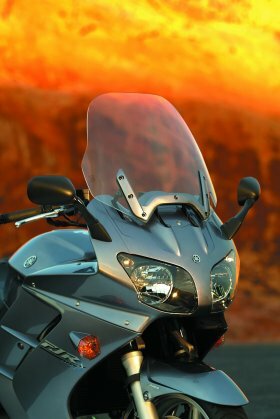 In fact, Yamaha invented a new category: Supersport-Touring. If the critics are to be believed, Yamaha must’ve done something right. 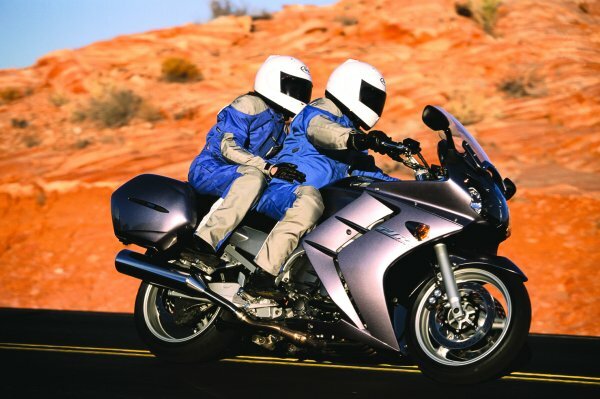 The FJR has won numerous press accolades for its perfect blend of sport and touring capabilities. Following a complete sellout last year, the 2004 FJR1300 returns with refinements to make it even better. Improvements include revised suspension settings, a four-inch taller windshield, larger 320mm brake rotors, an inner-fairing-mounted glovebox, integrated front turn signals, and a new Cerulean Silver color. 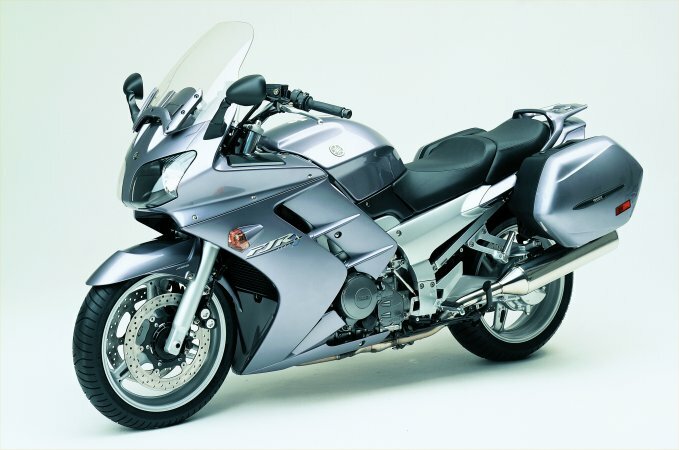 Also new for 2004 is the FJR1300ABS featuring an anti-lock braking system (ABS). The heart of the matter is the FJR’s R1-inspired 1298cc inline four – an engine that produces a road-punishing 145-horsepower and 99 foot-pounds of torque – with compact architecture that also allows it to be correctly placed in a bank-vault stiff all-aluminum frame for sportbike-like handling precision. That engine feeds power into a five-speed gearbox with stacked input and output shafts (a la R1) for compactness, and from there into a nearly maintenance-free shaft drive. Dual internal counterbalancers not only make the FJR motor ethereally smooth, the absence of vibration allows the engine to act as a stressed member in the bike’s massive alloy frame, thereby forming a rock-solid, yet lightweight foundation upon which to build. Smooth, in fact, is a theme that runs throughout the FJR. Fuel delivery is via advanced fuel injection with throttle position sensor, which delivers instant cold starts and turbine-like thrust with little regard to ambient conditions or load. A hydraulically actuated clutch and needle-bearing-mounted shift shaft provide light, precise gear selection. To that strong platform and provide sporty handling Yamaha mounts huge fork tubes–48mm in diameter – with revised rates, fully adjustable rebound and compression damping as well as spring preload. At the rear, a linkage-mounted shock controls a light and strong aluminum swingarm, which also carries the drive shaft in its left spar. A flip of a lever switches the rear shock’s preload instantly between lights, for one-up running, and heavy, for two-up riding or with loaded saddlebags. With 5.4 inches of travel in front and 4.8 inches at the rear, the FJR suspension is designed to provide a comfortable yet controlled ride whatever the load and road conditions. For 2004, the FJR’s front discs have grown from 298mm to 320mm, while super-rigid monoblock calipers continue to provide plenty of power along with superior feel. Also, optional ABS is now available for even greater braking confidence, especially on wet surfaces. Now that we’ve established the FJR’s “sport” credentials, let’s talk touring. A broad, thick dual-density foam seat gives rider and passenger all-day support behind an electrically adjustable windshield that’s four inches taller. Handlebars reach back to meet the rider in a natural, nearly upright position, and though the fuel tank holds a full 6.6 gallons, it’s narrow at the rear to give the FJR a feeling of lean maneuverability. In addition to the pair of locking, detachable 7.9-gallon accessory saddlebags that come as standard equipment, the FJR also gets a new small-item storage compartment in its left front fairing inner panel–and don’t forget the stylish new integrated front turn signals. An analog speedometer and tachometer endow the FJR with that classic grand-touring look, while an LCD display keeps an eye on other important operating parameters and performs diagnostic functions as well. There’s even a digital clock. A pair of R1-looking multi-reflector quartz-halogen lights are adjustable from inside the cockpit, and the aero theme continues at the rear in the form of a sleekly integrated taillight/turn indicator assembly (which also allows the bags to tuck in nice and tight). Light weight is the other critical ingredient when the subject is high performance, and it happens to be another key to the FJR’s sudden rise to the top. With all that the FJR offers – 1298cc punch, shaft drive, electric windshield, 6.6-gallon fuel capacity, etc. – the FJR weighs in at 537 pounds, dry, making most other sport-touring motorcycles feel paunchy. For now, Yamaha seems to hold a de facto patent on Supersport Touring. The 2004 FJR1300 will be available in limited quantities for $11,599 or equipped with ABS for $12,599. Beginning February 1 through April 30, 2003, customers will be able to special order a 2004 FJR1300 or 2004 FJR1300ABS at their favorite Yamaha dealership. By placing a $500 deposit, customers not only get guaranteed delivery but they will also receive special retail financing terms on the FJR of their choice. Dealer deliveries are expected to begin in early July with final shipments completed by the end of 2003.